There is a hadith of the Holy Prophet(S.A.W.) that when you travel, you should give charity (sadqa). So is it not better to give the money of Imam-e-Zaamin before you go on your journey rather than when you get back, so that it may reach the poor quicker. It is said that the Sura of Tawheed (Sura Ikhlas) if written and cut into two halves, one given to the traveller and the other left at his home, will always come together again and so ensure the safe journey of the traveller. The king at the time of our 8th Imam, Imam Ali ar-Reza (A.S.) was Mamun al-Rasheed. Mamun had forced Imam (A.S.) to take the position of his heir apparent (i.e. Imam (A.S.) was supposed to take over as king after Mamun); because he wanted to be accepted by the Shias. Although Imam (A.S.) did not want to take this position, he made full use of it to preach Islam openly. To show to the people how much he thought of Imam (A.S.), Mamun changed the colour of his court from black to green , he also had new coins made with Imam Ali ar-Reza's (A.S.) name on it. Each Imam (A.S.) is remembered for a specific thing: EX: 4th Imam, Imam Zainul Abideen (A.S.) - In illness. 6th Imam, Imam Jafar as-Sadiq (A.S.) - For sustenance. And in the same way our 8th Imam, Imam Ali ar-Reza (A.S.) is called upon when someone is about to go on a journey. The eight Imam, Imam Ali ibne Musa ar-Reza (A.S.) is also called as Imam-e-Zaamin(A.S.). When Muslims go on journeys they take with them something called Imam-e-Zaamin (another name for Imam Reza (A.S.)) which is some money tied in a cloth. This tradition probably came from the time of Imam Reza (A.S.) when people used to carry money with them especially because it had Holy Imam's (A.S.) name on it. As Mamun, the Abbasid caliph the contemporary of Imam Reza (A.S.), had coins minted with the name of Imam Reza (A.S.) on them, it was very easy for the Muslims to carry the name of Holy Imam (A.S.) with them, especially when they went on journeys. Imam Reza (A.S.) is also known as Imam-e-Zaamin (A.S.). Zaamin means "The Guarantor". One day when Imam Reza (A.S.) was on his historical journey from Madina to Marw(Khurasan), while in a jungle the Holy Imam(A.S.) came across a hunter who was about to kill a deer. The deer was trying to get away and when she saw Holy Imam (A.S.), she said something to him. Holy Imam(A.S.) asked the hunter to free the deer so that she could go and feed her little baby deer who were very hungry. Imam Reza (A.S.) also told the hunter that once the deer had fed her babies she would come back. The hunter allowed the deer to go because Holy Imam (A.S.) had told him to, but he did not think the deer will come back. But Imam Reza (A.S.) waited with the hunter until the deer returned with her young ones. The hunter was amazed on witnessing this miraculous event and he set the deer free as a mark of respect for Imam Reza (A.S.). After this historical event Imam Reza (A.S.) became famous as Imam Zaamin (A.S.). The famous artist of the contemporary world, Ustad Mahmud Farshchiyan has depicted this historical event in this beautiful masterpiece iconograph entitled "Zaamin-e-Aahu" (The Guarantor of the Deer). That day Sulayman bin Ja'far Ja'fari and Imam Reza (A.S.) had gone out together for some work. It was sunset when Sulayman wanted to return home. Imam Reza (A.S.) said to him: "Come to my house and be with us tonight." Sulayman agreed and with Imam (A.S.) he went to his house. Imam (A.S.) saw his servants busy in gardening. By the way, he saw a stranger, who was also busy in gardening with them. Imam (A.S.) asked: "Who is he?" The servants replied: "We have hired him today so that he may help us." Imam (A.S.): "It'a all right. How much wages have you fixed for him?" Servants: " We will give him something and would make him satisfied." Why do you make yourself uncomfortable?" Imam (A.S.) said: "I have repeatedly given orders that till the work and wages are not fixed, never get the work done by anyone. First fix the wages of the person and then get the work done. Even if you have fixed the wages, you could give something extra to him after the work is over. Certainly, when he finds that you have given him more than the fixed wages, he would be thankful to you and would like you. And the affection between you and him would increase. And even if you would give him the wages you have fixed, the person would not be unhappy with you. But if you do not fix the wages and employ someone to work, whatever you would give him after the work, he would not think that you have done a favour to him. Rather, he will think that you have given him less than his actual wages." On Imam Reza (A.S.) arrival in Marw(Khorasan), the seat of Al-Ma'mun's caliphate, the Abbasid caliph showed him hospitality and great respect, then he said to him: "I want to get rid of myself of the caliphate and vest the office in you." But Imam Reza(A.S.) refused his offer. Then al-Ma'mun repeated his offer in a letter saying: "If you refuse what I have offered you, then you must accept being the heir after me." But again Imam Reza (A.S.) refused his offer vigorously. Al-Ma'mun summoned him. He was alone with Al-Fadl ibn Sahl, the Iranian noble incharge of two offices (i.e., military and civil). There was no one else in their gathering. Al-Ma'mun said to Imam Reza (A.S.), "I thought it appropriate to invest authority over the Muslims in you and to relieve myself of the responsibility by giving it to you." When again Imam Reza (A.S.) refused to accept his offer, Al-Ma'mun spoke to him as if threatening him for his refusal. In his speech he said, "Umar ibn al-Kahttab made a committee of consultation (shura) (to appoint a successor). Among them was your forefather, the Commander of the faithful, Ali ibn Abi Talib. (Umar) stipulated that any of them who opposed the decision should be executed. So there is no escape for you from accepting what I want from you. I will ignore your rejection of it." In reply, Imam Reza (A.S.) said: "I will agree to what you want of me as far as succession is concerned on condition that I do not command, nor order, nor give legal decisions, nor judge, nor appoint, nor dismiss, nor change anything from how it is at present." Al-Ma'mun accepted all of that. On the day when Al-Ma'mun ordered to make the pledge of allegiance to Imam Reza (A.S.) one of the close associates of Imam Reza (A.S.), who was present, narrates, "On that day I was in front of him. He looked at me while I was feeling happy about what had happened. He signalled me to come closer. I went closer to him and he said so that no one else could hear, 'Do not occupy your heart with this matter and do not be happy about it. It is something which will not be achieved.' "
It is written in 'Dhillul Mateen' that Meer Mu'inuddin Ashraf who was one of the virtuous attendants of the shrine of Imam Ali-Ar-Reza (A.S.) says that, "Once I dreamd that I was in the shrine of Imam Reza (A.S.) and was coming out to perform ablution (Wuzu). When I came near the mound of Ameer Ali Sher, I saw a group of people entering the shrine. An eminent personality was leading them, and they all carried spades in their hands. As soon as they entered the shrine, the eminent personality pointed towards a particular grave and said, "Dig out the wretched fellow from his grave". Hearing his command they started digging the grave. I asked one of those men as to who that man was. He replied that He was the Commander of the faithful Imam Ali (A.S.). Suddenly I saw that Imam Ali-Ar-Reza (A.S.) came out of His shrine and greeted Imam Ali (A.S.). Hazrat Ali (A.S.) answered His greeting. Imam Reza (A.S.) said, "O my Respected Grandfather! I request you, and have faith, that you will forgive this person on my behalf who lies buried here under the shelter of my shrine". Amirul Mo'mineen (A.S.) answered, "O my dear son! Do you know that he was a mischief-creator, an adulterer, and a drunkard"? Imam (A.S.) replied, "I do know, but when his last moment neared he willed to be buried under the shelter of my shrine, so I request you to forgive him on my behalf." Hazrat Ali (A.S.) forgave him and left. I awoke from my sleep in awe and woke up the other attendants and related to them my dream. We all went to the place which I had seen in my dream, and found a newly constructed grave, whose mud was scattered. After inquiry we learnt that a Turkish man who had died was buried there the day before". Haji Ali Baghdadi had the honour of meeting Imam Mahdi (A.S.) and ask him some questions. One of the questions put forward by him was that "Is it true that a person who goes for the pilgrimage (Ziyarah) to the shrine of Imam Hussain (A.S.) on Friday night receives salvation"? Imam (A.S.) replied, "Yes, by Allah". Haji Ali Baghdadi says that I saw tears in the eyes of Imam (A.S.). Then I asked him another question, "In the year 1269 A.H. when we went for the pilgrimage (Ziyarah) to the shrine of Imam Reza (A.S.), we met a nomadic Arab who was a native of Najaf. We invited him for a meal and asked him his views regarding the reward of the love of Imam Reza (A.S.). He replied, "Paradise", and said, "Since the past fifteen days I have been the ZAIR(pilgrim) of Imam Reza (A.S.), do Munkir & Nakeer' have the nerve to come near me. The food which I consumed from the table of Imam Reza (A.S.) has turned into flesh and blood". I asked Imam Mahdi (A.S.) whether his claim was true. Imam (A.S.) replied, "Yes it is true. Imam Reza (A.S.) himself will come and save him for the questioning in the grave. For verily by Allah! My Grandfather is a Zamin (Surety) Imam". 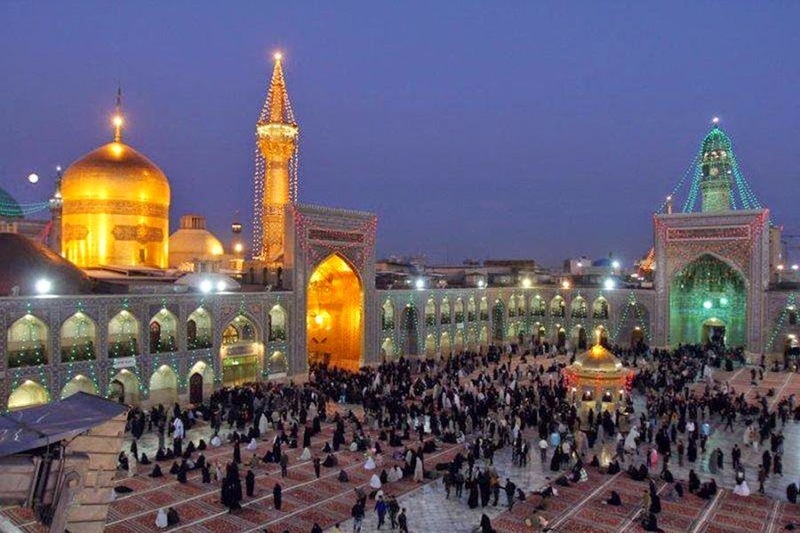 Ibrahim bin Abbas, who was one of the high-ranking officials of the Abbasid caliphate, has left the following eyewitness account of Imam Reza's (A.S.) impeccable character. - His Holiness never irritated others by verbal or practical teasings. - His Holiness did not interrupt others speeches. - The Holy Imam (A.S.) never refused the demands of others. - I never witnessed him to have his legs stretched out before the others. - And I could never find him in a resting position in the presence of other people. - His Holiness never swore at his servants. - His Holiness never cachinnated in happy circumstances. - I never saw him spit his saliva out. - At dinner all his servants including porters and even the stablemen were served in his attendance. - His Holiness used to stay up all nights invoking Allah the Almighty. The Holy Imam (A.S.) also observed regularly the religious duty of fasting and always gave alms in secret.